South African drummer Cobus Potgieter has released a short film about having two drum clinics in his home country after being away for nine years. He now lives in Los Angeles. 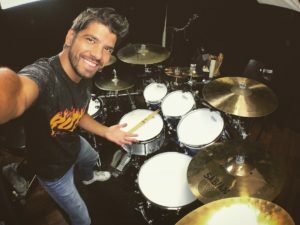 In the film, Cobus talks about drumming and how the instrument has pushed him out of his shell, while still remaining true to his introverted nature. In the film, he meets one of his biggest fans named Andrew who sees Cobus as an inspiring figure in his life. As a drummer myself, Cobus has certainly inspired me on many occasions, and his videos will motivate to become better at the instrument. I’ve been watching pretty much since the beginning and Cobus’ improvement over the years has been very cool to watch. If you want a little taste of his talent, check out his Youtube channel and click on his cover of “Stand Up” by Ludacris, where he absolutely kills it! Happy Monday everyone, enjoy!